What is not to love about Sea Marsh II in the Cherry Grove section of North Myrtle Beach, South Carolina? This North Myrtle Beach resort is on the oceanfront. This North Myrtle Beach resort features an indoor swimming pool so you can take a break from the sun and still go swimming. This North Myrtle Beach resort has a large wooden sun deck on which you can lay out and get a great sun tan. There is a three-level parking garage at this North Myrtle Beach resort. And this North Myrtle Beach resort only has four condominiums per floor so you can enjoy a more intimate setting while marveling at your oceanfront North Myrtle Beach vacation. The North Myrtle Beach vacation rentals at Sea Marsh II are all three bedrooms. There is so much space in these North Myrtle Beach condominiums that you will hardly believe it. These three-bedroom North Myrtle Beach rentals all have three baths. These condos in North Myrtle Beach, South Carolina are furnished so that you can sleep between six and nine people most comfortably. Enjoy the open layout of these North Myrtle Beach condominium rentals were the kitchen, dining area and living room are all one big great room. The kitchen in each of these condos in North Myrtle Beach, South Carolina is nicely furnished with dishes and cookware. You can truly make yourself at home when you can keep your drinks icy cold in the refrigerator, ice ready to go in the freezer and snacks scattered in the cupboards, just like at home. And when it comes time to tidy up your kitchen, take advantage of the dishwasher! 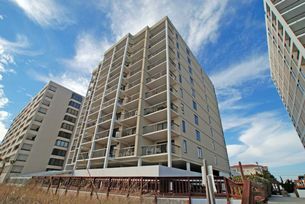 Many of these North Myrtle Beach condominiums have a breakfast bar so you can have cereal ready for the kids when they wake up, coffee cups out for the adults when they wake up and sandwiches available at lunch time. These North Myrtle Beach rentals at Sea Marsh II are all non-smoking units. They all feature an oceanfront balcony that is furnished for your utmost relaxation. All of the North Myrtle Beach vacation rentals here also have at least one DVD player so you can watch a movie during your North Myrtle Beach vacation. They all also come with a washing machine and clothes dryer. Some of the Sea Marsh II North Myrtle Beach condominium rentals have high-speed Internet access and some of these condos in North Myrtle Beach, SC accommodate two people on a sleeper sofa in the living room. For all the guests of Sea Marsh II the swimming pool is really just steps away from the front door of your North Myrtle Beach condo rental. And from the swimming pool and wooden sun deck area, the beachfront is another few steps away. Elliott Beach Rentals is not affiliated with onsite management or the HOA of Sea Marsh Ii.